Two vintage 1970's ceramic floral coffee mugs. Main color is off-white or antique white. The mugs have orange, brown and white flowers. The front and back are slightly different. If I remember correctly, these mugs were purchased new in the late 70's. 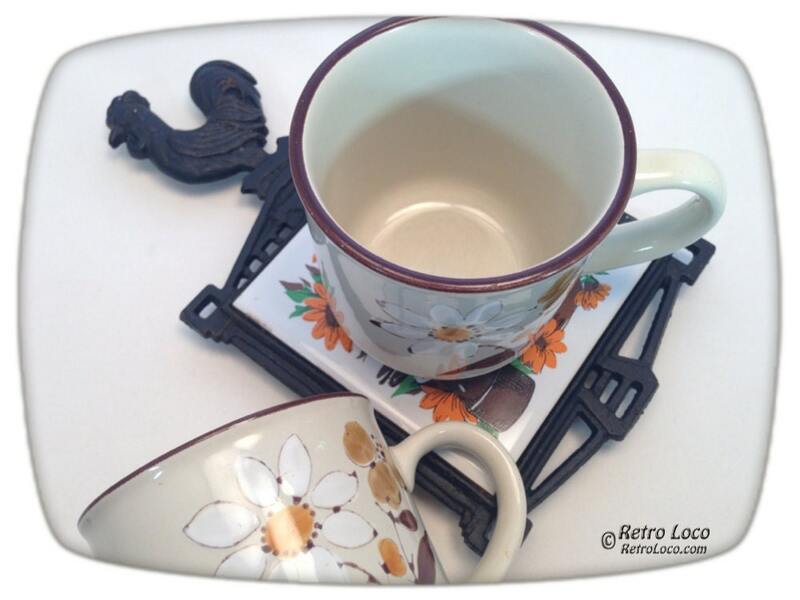 They will look great in a seventies vintage-style kitchen or in a kitchen with an early 80's theme. They would also like nice in a cabin. The colors and style of the flowers are 70's country and rustic. Imprinted on bottom of mugs: Made in Korea. ❉ WHAT YOU WILL RECEIVE: Two ceramic coffee cups. ❉ Age: Vintage late 1970's. ❉ Color: Off-white with brown and orange flowers. ❉ Condition: These coffee cups are getting old, and they do have some wear and several little black scratches. If you zoom in on the 3rd and 4th photos, you will see the black scratches.